The Wayzata Athletic Boosters (WAB) is an all volunteer organization whose mission is "to sustain and promote the ongoing participation of Wayzata High School youth in quality athletics." Wayzata Athletic Boosters provide supplemental funding for all Wayzata High School sports and activities. Through the support of our family and business members, Wayzata Athletic Boosters help fund much needed equipment, uniforms, and coaching staff to ensure every student who participates has a safe and positive experience. 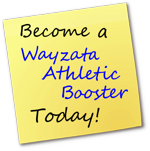 Visit our Family Membership page for info on becoming a member of the Wayzata Athletic Boosters. Discover the many businesses that support Wayzata Athletics & Activities. We encourage you to thank them with your patronage. We need volunteers to staff concessions for the spring sports. Follow the link below to sign up for a spot. The Wayzata Athletic Boosters would like to thank the following businesses that have made donations to support Project SCORE, the Wayzata High School stadium scoreboard replacement project. Click Project SCORE for more information about this and future fundraising opportunites for your business. To see the entire list of local business boosters, click here.